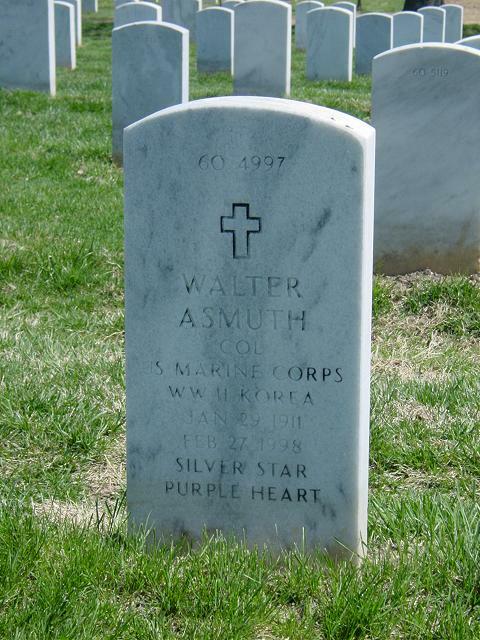 Walter Asmuth Jr., 87, a retired Marine Corps Colonel who was wounded and decorated while serving in the Pacific in World War II, died of cancer February 27, 1998at the Knollwood retirement residence in Washington. Colonel Asmuth was born in Washington. He graduated from the old Central High School and then went to the U.S. Naval Academy at Annapolis. He graduated in 1932 and was commissioned in the Marine Corps. His assignments in the 1930s included a tour of duty in Shanghai, China. He was the commanding officer of the Marine detachment aboard the battleship Nevada at Pearl Harbor when the Japanese attacked on December 7, 1941, bringing the United States into World War II. Colonel Asmuth subsequently served in the Guadalcanal campaign and elsewhere in the Pacific. He was a battalion commander in the 3rd Marine Division during the invasion of Guam when he was severely wounded and decorated with the Silver Star for gallantry. In the postwar years, Colonel Asmuth served in Washington and at various Marine Corps bases in the United States. He also graduated from the National War College and was a military attache in London. During the Korean conflict, he was stationed in Japan for a year. At the time he retired in 1960, he was commanding officer of the Marine barracks on Guam. Colonel Asmuth then settled in Bethesda and was a systems analyst for General Electric for 10 years. In 1970, he moved to Virginia Beach, where he was active in community affairs and was a volunteer mathematics and English teacher at the Star of the Sea parish school. In 1995, Colonel Asmuth returned to Washington and settled in Knollwood. Besides the Silver Star, his military decorations included the Bronze Star with combat "V" and the Purple Heart. His marriage to the former Betsy Ann Steele ended in divorce. His second wife, the former Janice Walsh, died in 1994. Survivors include a daughter from his first marriage, Susan Foley of San Diego; three children from his second marriage, Walter Asmuth III and Peter Walsh Asmuth, both of Washington, and Michele Asmuth of Seattle; four sisters, Minnie Cheseldine, Eileen Goenner and Anne Meade, all of Washington, and Geraldine Murphy of Albuquerque; and eight grandchildren. On February 27, 1998 of Washington, DC, husband of the late Janice Walsh Asmuth; beloved father of Walter Asmuth III, Michele Asmuth, Peter Asmuth and Susan Fowley. He is also survived by eight grandchildren and four sisters. Friends will be received at Knollwood, 6200 Oregon Ave., NW, Washington, (202-541-0400) on Thursday, March 5 from 7:30 to 9:30 p.m. Mass of Christian Burial will be offered 11 a.m., Friday, March 6 at The Shrine of the Most Blessed Sacrament Catholic Church, 6001 Western Ave., NW, Washington, DC. Interment Arlington National Cemetery at 3 p.m. Colonel Asmuth was born in Washington, DC, and graduated from high school there in 1928. He then entered the Naval Academy and graduated in 1932 at the depths of the depression. At that time, half the class was not commissioned because of a lack of spaces, but Midshipman Asmuth had done well enough to receive a commission as a Marine second lieutenant. After training, he served aboard the battleship USS Arkansas. Here he experienced life in the interwar military—deployments to the east coast, west coast, and Europe, periods of drydock, field training for the Marine detachment when the ship was in port, and gunnery practice. Next he went to Shanghai, China, for service with the 4th Marines. An expert marksman, he went to Peking for a rifle tournament in July 1937, and was there for the "Marco Polo Bridge Incident"—a minor clash between Japanese and Chinese troops, but one that Japan used as an excuse for invading China. One of the first Americans to see the Japanese war machine in action, he watched as the Japanese pummelled the Chinese with artillery and aircraft and then assaulted with infantry. The Marines in Peking conducted an operation to protect American citizens during the fighting. They put the Americans up in tents in the embassy compound including "one family with nine children and a goat who camped right on the Ambassador's front lawn." Eventually, Lt Asmuth made his way back to Shanghai where he helped guard the International Settlement as the Japanese drove the Chinese forces out of the city and inland. In June 1941, he joined the Marine Detachment aboard USS Nevada at Pearl Harbor as detachment commander. He was aboard the ship that fateful Sunday morning when the war in the Pacific began. During the attack the 70 Marines of the detachment manned their various guns and fought with distinction. Then-Capt Asmuth had trained them well. Two detachment Marines received Navy Crosses for their actions. Nevertheless, it was a grim day for Nevada. Hit by a torpedo and five bombs, her forward deck a shambles, she was beached on Hospital Point to avoid sinking in the ship channel. Despite rumors of his death among Naval Academy classmates, Capt Asmuth escaped unscathed. His ship having been sunk, Capt Asmuth was available for reassignment. In July 1942, having been promoted to major, he took command of newly activated 3d Battalion, 9th Marines (3/9). He trained the battalion at Camp Pendleton through the fall and winter, and in January they shipped out for New Zealand. On 1 November 1943, the battalion landed in its first combat operation—Bougainville—a key step in the campaign to neutralize Rabaul. The landing was difficult. Rough seas damaged craft and Japanese resistance destroyed many more. Units became interspersed and lost. Control quickly descended to small unit leaders. Nevertheless, the Marines established themselves ashore. In later years Col Asmuth would comment, "Nothing is as thoroughly planned as an amphibious operation, but little planning survives contact with the enemy." When the Japanese landed near his troops in an effort to launch a major assault in the entire beachhead, LtCol Asmuth immediately made a reconnaissance of his front lines and informed himself of the enemy strength and dispositions. Thereafter, he skillfully organized and launched a counterattack and succeeded in repelling the Japanese until his flank could be reinforced. For 3/9 the remainder of the campaign consisted of a slow expansion of the beachhead. All these actions took place in one of the worst environments of the war—thick jungles, bottomless swamps, swarms of insects, lurking crocodiles, and constant rain. LtCol Asmuth later recalled that the men's feet were literally rotting off. The Bougainville campaign lasted 57 days for the 3d Marine Division. It was followed by a few months on Guadalcanal to reorganize and train for its next operation—Guam, which began on 21 July 1944. The 9th Marines landed on the right (south) end of the division sector, with 3/9 in the assault. The plan called for 1/9 and 2/9 to follow 3/9 across the beach, whereupon 3/9 would become the regimental reserve. The prelanding bombardment was a ferocious and synchronized attack by air and naval gunfire—the result of hard lessons learned during previous landings. Nevertheless, 3/9 met fierce fire as it came ashore. Once across the beach, it crossed a rice paddy and continued on to the steep ridge behind the shore. Progress on the left was unexpectedly rapid. On the right, however, Company I took fire from the caves on Asan point. LtCol Asmuth sent in Company L, the battalion reserve, to help out. By 1350 the battalion had reached its objective and at 1415 the battalion reverted to regimental reserve as 1/9 and 2/9 pushed through. Landing under heavy fire, LtCol Asmuth personally directed the operations. . . . When his battalion was delayed by enemy fire, he went forward to his front lines. . . . While thus engaged, he was seriously wounded but refused to be evacuated and continued to lead his battalion until the objective was secured. Although LtCol Asmuth recovered fully from his wounds, the war in the Pacific was over for him. In the postwar years Col Asmuth served in London as amphibious plans officer for the Eastern Atlantic, on the staff of the JCS, and as chief of staff of the 3d Marine Division. His final duty station was as commanding officer of the Marine Barracks on Guam, where he was fondly remembered as one of the island's wartime liberators. He retired from the Marine Corps in 1960 and accepted a position with GE Information Systems working on specialized equipment for military intelligence. In 1970 he retired for the last time and moved to Virginia Beach with his wife, Janice. He died on 27 February 1998 and is buried in Arlington Cemetery beside his wife.